The Pintos started the week at Greenlands playing their Sycamores and had a splendid, if challenging morning, played in good company. The Pintos came away with two rinks, which is always a good away result and further rink was just a 3 point deficit. Meanwhile the Raiders were at home to the Romulans from San Luis, who struggled to adjust to the mat, enabling the Raiders playing well to take 4 rinks. 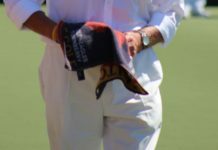 In the afternoon the Palominos were at San Luis against the Vulcans and came away with one rink, but many of the inexperienced players will have learnt much about handling a tricky mat. On Friday morning the Rangers found themselves, up against a very over strength Vistabella Swingers at home, I do find it tragic to see such obvious A division quality players playing in the C division, it can’t be good for all round moral. But there it is, although the Rangers took just the one rink, they played well under the circumstances and should only consider the quality of their own shots and be proud. 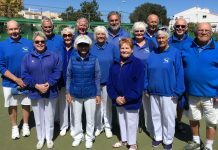 In the afternoon the Mustangs entertained a strong San Luis Lions and played some fine bowls in some close matches, although one or two of us might be disappointed with our play today. But our older bodies don’t always behave as they should and we still enjoy the game and company. But the final score wasn’t bad against the Lions, who played well; the Mustangs took two rinks and had a shots deficit of just ten. Saturns played San Miguel Pointers and got a great 6-6 draw, aggregate 80-88 winners were B Taylor T Roche R Ede 19-13, M Elliott J Gregory J Mulloy 17-14, A Gower L Bath G Smith 16-14. In the Discovery Division, The Sycamores were at home to El Rancho Pintos. Final score – 95 – 85. 8 – 4. best winning rink, Z Wilcock, R Stansfield, skip T Hill. 25 – 11, In the Voyager Division, the Chestnuts were away to La Siesta Sputniks. final score, 82 – 102. 3 – 9. winning rink V Young, C Stobbart, skip G Watt. 23 19. The final score being 61 shots for to 84 against, giving us 2 points to 10 against. The Falcons really need to concentrate on the last 5 matches, 3 of which are at home so we have no excuse. It is our advantage so let’s use it. 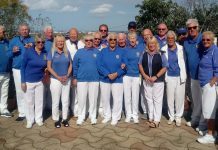 On Friday the Royals were away to La Manga. That is the end of that report!! I believe our captain used the word Massacre. It is an experience playing at La Manga being the only grass surface. All you could hear from the other rinks was “you need to give it more welly”, as the bowls are falling short. In saying all that, we did manage to produce some good bowling, just not enough. The final result was 46 shots for to 114 against giving us a grand total of zero to 12 against. I cannot not mention the friendly match that both sides put out. All played in good spirits, fun and enjoyment. The end result being a draw 13 -13. The Royals also have 5 remaining matches, 3 of which are at home, so the same applies. We have to gain points at home. Thanks for your introduction last week Dave. I have some big shoes to fill, but not in size. Monday, 18-2-19 saw the Explorers away to San Miguel Alsations. Shots for 78, against 79. Points for 5 and against 7. Best winning rink, Anne Stone, Phil Pape and Peter Parsons 23-10. The Pathfinders went down to San Miguel 63 shots to 104. Points were 4 to LM and 8 SM. John Withers and John Rae the only winning rinks. Wednesday, 20-2-19, in the Winter league, LM we’re playing Java Green. A close game on the whole as the points were shared 6 each. The shots being LM 78 and JG 81. Friday, 22-2-19. LM Merlin’s we’re away to Greenlands Elms. LM had a good day and won on all rinks so Merlin’s 12 points and GE 0, shots for 105 and against 57. Dave Hadaway was the best winning rink, 27 – 13. This is the Merlin’s third consecutive clean sweep, well done you Merlin’s. La Marina Ospreys were playing La Siesta Blues and won on 4 rinks, so points for 10 and against 2, shots being 96 LM and 66 LSB. Best winning rink, Janet Parsons, Jean and Don Fowkes, 26 – 11. In the Enterprise Division The Apollos away at Vistabella Drivers managed to win on the rink of Trish and Pat Reilly with George Richardson 26-15 whilst two further rinks provided draws enabling the Apollos to pick up 4 points losing the overall match by a close 85 shots to 78. In the Voyager Division the Pioneers entertained league leaders Vistabella Buggies and found the going tough winning on the rink of Doug and Fay Beattie with Norman Adcroft picking up 2 points in a loss by 119 shots to 69. Better news for the Sputniks at home to Greenlands Chestnuts winning by 102 shots to 82 picking up 9 points keeping the team in a good mid table position .Best winners were Jen and Lee Plummer with Joe Kocsis winning 25-11. Big thanks to John Clarke playing with a damaged shoulder and owner Jim Hudson for playing ensuring that we fielded a full team. 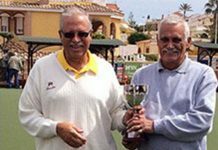 A home win In the Winter League for La Siesta against Bonalba winning the match by 88 shots to 76 picking up an 8 points to 4 win. Winning rinks for a Siesta came from Pat Moore and Dave Laverick with Dawn and John Taylor 25-10, Doug and Fay Beattie with Bill and Sue Jordan 20-13 and Barbara Cooper, Val Dalton with Mike and Florence Edwards winning 20-14. In Division C the Silvers had a bye this week. What a glorious week for bowling! Very pleasant conditions and some unseasonably high temperatures for February. There have been some very hard matches for the Quesada squads – some that have impacted the league positions. But there’s still a few weeks to go, so plenty to play for. 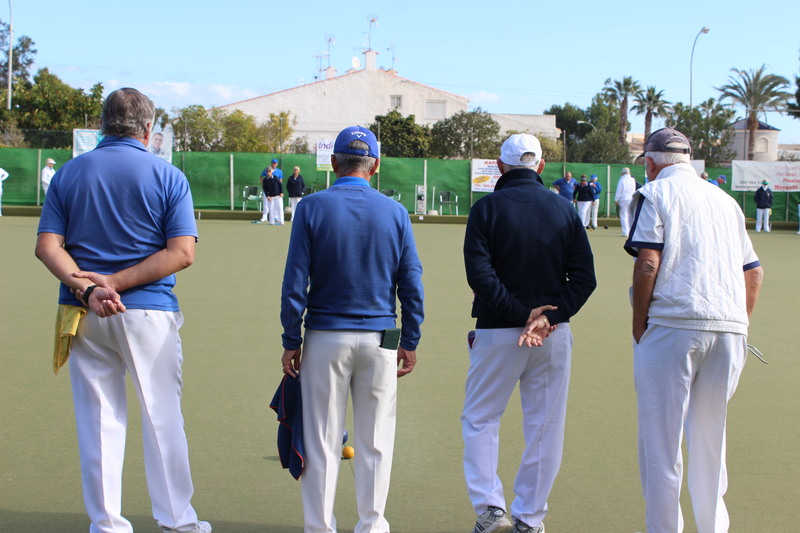 In the South Alicante Winter League, Quesada Pearls played San Luis Trekkers who won the match 8-4 and 98-88. Unfortunately this means the Pearls have slipped to 4th in the league but only 2 points behind San Miguel Beagles so hopefully a good win next week will see them back in 3rd. The Diamonds suffered their highest loss of the season at home to leaders San Luis Klingons. San Luis won on all 5 rinks with 103 shots to Quesada’s 49 and won the match 12-0. Quesada Rubies also had a bad day with a defeat by Greenlands Maples, who won 12-0 and shots 127-63. Results in the Southern League included a win for Quesada Swallows against San Miguel Bulldogs. The Swallows won the match 8-4 points and 84-75. A different story for the Swifts however, playing rivals San Miguel boxers. Although there were some close matches on some rinks, San Miguel boxers played extremely well and walked away with all 12 points and shots 108-64. This defeat means the Swifts will slip to 4th place in the league and now leave themselves a lot of work to do to try to catch up. Finally in this league, Quesada Swans also lost to La Siesta Golds, who won the match 8-4 points but Quesada won the shots 88-79. 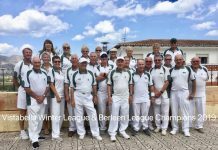 In the Winter league, Quesada played host to Benitachell in an incredibly close and competitive match resulting in a draw, 6 points each and the shots were 87 Quesada and 85 BBC. This performance means Quesada are now in 4th place in the league. Meantime, in the Federated 4’s, Quesada Panthers played San Luis Condors in another close match, which the Panthers won 6-2 points and 53-47 shots. 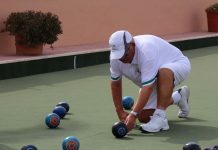 SAN LUIS BOWLS CLUB REPORT 22.02.19. Another busy league week + club competitions; playing for semi-final places in March. SA League Monday 18th Klingons away v Q Diamonds, excellent result; 10pts-2, 103shots-49. Winners: Ann Holland, Giuseppe Galelli, Ray Pollock 27-10, Kath Reid, Pam Lockett, Ian Kenyon 16-13, Bob White, Ray Clarke, Neil Morrison 17-12, William Holtham, Sabrina & Russell Marks 22-7, Colin Jackson, June & Keith Jones, 21-7. Trekkers home v Q Pearls, good result 8pts-4, close shots 98-88. Winners: Ros Holmes, Marina Beardsall, Brian Pocock 24-14, Irene Everett, Allen Bowen, Les Bedford 19-14,.Pat & Graham Bird, Derrick Cooper 25-22. Vulcans good result home v ER Palaminos, shots 102-53, 10pts- 2. Winners: Derek Barker, Dave Tilley Sue Ross 20-8, Ray Watmough, Steve Rossiter, Bob Bromley 18-10, Audrey Ford, Ian Ross, Malcolm Ayton 21-9, Kath Waywell, Margaret Clarke, Drew Russell 31-13. Romulans away v ER Raiders, 2pts-10, 59shots-143. Chris Phillips, Robert Hicks, Lyndon Johnson 21-13. Wednesday 20th Winter League: BYE. FED 4’s League: Thursday 21st Ospreys away v SM Cherokees 5pts-3, 64shots-58. Winners: Raymond & Margaret Clarke, David Blackie, Scott Malden 20-20, Pam Lockett, Neil Cox, June & Keith Jones 25-14. Condors away v Q Panthers 2pts-6, 47shots-53. Winners: Ros Holmes, Bob Bromley, Peter Fuller, Neil Morrison 19-16. Southern League: Friday 22nd Lions away v ER Mustangs, a great result, shots 94-85, 8pts-4. Winners: Kath Reid, Pam Lockett, Ian Kenyon 18-17, Bob White, Ann Holland, Ray Pollock 20-11, William Holtham, Giuseppe Galelli, Keith Jones 27-11. Tigers, a good result home v VB Picadors, 101shots-70, 8pts-4, Winners: Allen Bowen, Les Bedford, Scott Malden 23-10, Ros Holmes, Jan & Brian Pocock 21-12, Pat Bird, Bill Webb, Graham Bird 30-8. Leopards home v ER Broncos, a good result: 8pts-4, 106shots-82. Winners: Ray Watmough, Dave Tilley, Drew Russell 36-5, Dennis Jackson, Steve Rossiter, Bob Bromley 22-17, Kath Waywell, Derek Barker, Sue Ross 19-16. Pumas, away v EI Outlaws, had a hard day at the office: 0-12, 49shots-128. We are a competitive but friendly club; you’re welcome to join in “Vic’s hamper” on Saturday & some Tuesday mornings. 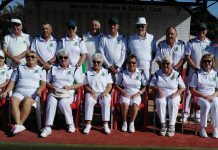 For more information & calendar, check SLBC website at: www.sanluisbowls.byethost7.com We welcome new & experienced bowlers, come along & see us, or for more help contact June Jones, Club Captain: 691903773. San Miguel Dalmations were away to La Marina Pathfinder, winning 8 – 4 (104 shots to 63). The best winning triple were Sheila Errington, Sandra Hannan and Brian Errington 30 – 7. San Miguel Alsations were home to La Marina Explorers winning 7 – 5 (79 shots to 78). The best winning triple were Marilyn Shatwell, Paul Hayward and Alan Booth 19 – 9. San Miguel Pointers were away to Emerald Isle Saturns where they drew 6 – 6 (88 shots to 80). The best winning triple were James Cutting, Pat Staden and Lynn Greenland 29 – 13. San Miguel Beagles were home to Monte Mar Matadors winning 8 – 4 (91 shots to 85). The best winning triple were Noel Davis, Dave Johnson and Carol Bloomfield 27 – 14. 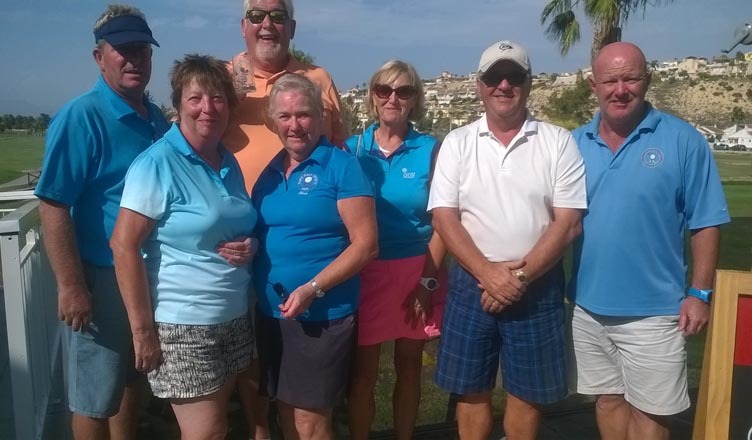 In the Winter League San Miguel were away to Greenlands where they lost 10 – 2 (78 shots to 92), on the winning rink were Noel Davis, Sue Milner, Gail Willshire and Fred Willshire 18 – 10. In the Fed 4’s San Miguel Apaches were away to Greenlands Ash where they picked up all the points winning 8 – 0 (53 shots to 31). The best winning rink were Anita Brown, Reg Cooper, Ron Nairey and Alan Campbell 23 – 7. And Miguel Cherokees were away to San Luis Ospreys loosing 5 – 3 (64 shots to 58) On the winning rink were Brian Miler, Allan Patterson, Stuart Hemmings and Steve Cantley 24 – 19. San Miguel Mohawks had a bye. 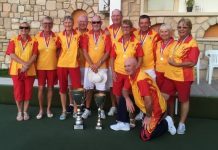 On Friday San Miguel Boxers were away to Quesada Swifts where they had a great win 12 – 0 (108 shots to 64), the best winning triple were Bob Nesbitt, Ann Young and Barbara Scotthern 24 – 10. San Miguel Bulldogs were home to Quesada Swallows loosing 8 – 4 (84 shots to 75). The best winning triple were Pat McEwan, Shiela Booth and Dave McEwan 20 -15. 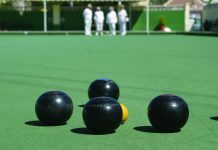 San Miguel bowlers enjoyed a Valentines week-end competition, with a cliff hanger of a final at 6 -6 on the last end, Val Hignett and Ron Nairey were declared winners after a measure and the worthy runners-up were Pat McEwan and Allan Patterson. 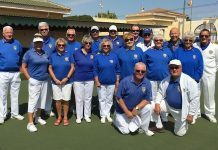 VISTABELLA BOWLS REPORT SPONSORED BY TV CHOICE & VENTURE FLEET. 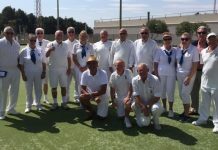 SAL ENTERPRISE League Albatrosses home match against the Emerald Isle Titans ended in a draw, they had three wins but lost the long game to the opposition…a very fair result. Shots, VB 86(6) -91(6) EI. The Drivers were also at home playing La Siesta Apollos. They went one better with two wins, two drawn games plus the long game..a good result. Shots, VB 85(8) – 78(4) LS. DISCOVERY League Eagles had a tough game away to the Emerald Isle Neptunes, the Eagles achieved a draw on one rink but unfortunately losing on the others. Shots, VB 52(1) – 97(11) EI. VOYAGER League Buggies were away to La Siesta Pioneers. Wins on four rinks and a near miss on the fifth, a difficult rink but a great result. Shots, VB 119(10) – 69(2) LS. WINTER LEAGUE. At home against MonteMar…a lovely mornings bowling with lovely company and a smashing result, all finished off with good food and drinks. Shots, 133(12) – 49(0) MM. Vistabella is still top of the league…keep going. There was no Berleen played this week. SOUTHERN League div A. The Lanzadores were at home to Emerald Isle Claymores winning on four rinks and losing on one, another excellent ten points for the team. Shots, 104(10) – 61(2) EI. The Picadors away at San Luis playing the Tigers won on two rinks, an ok result on a tricky rink, so well done. Shots, VB 70(4) – 101(8) SL. Div C. The Swingers did exceptionally well playing on an even trickier rink..El Rancho! They were up for the challenge and beat the home team the Rangers on four rinks. Shots, VB 103(10) – 63(2) ER. The Conquistadors at home against the Greenlands Cedars, stiff opposition for our guys, they won on one rink and another was drawn..keep going. Shots, VB 59(3) – 106(9) G.
At home to the Leprechauns the Lords had another good result, winning on all rinks.